When ordering white SLIDING PVC windows with two sashes transparent single glass in September we offer fixed price 2000 Pounds per square meter with FREE instalation and delivery! *This offer is valid ONLY for sliding white windows with two sashes.The order is completed with a single transparent glass. The cost of the order does not include mosquito net and dismantling of old windows. 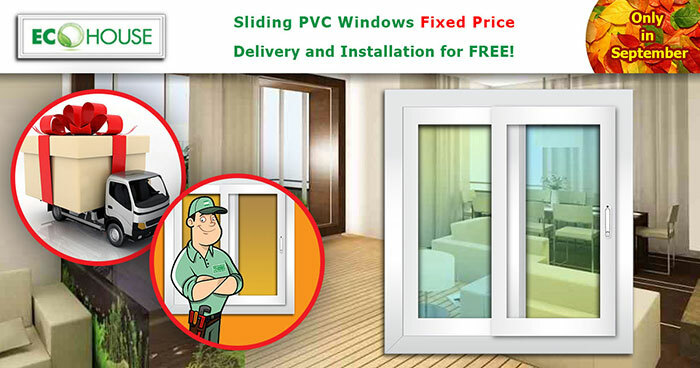 Installation and delivery is FREE ONLY if the order amount is more than 10000 LE and Only for windows of this type. Additional options: double-glazing, georgian bar, mosquito net and others, can be ordered additionally. The order is completed within 35 days. Advance payment when ordering 85% of the cost. We have already made fifty steps towards to our customers. And today it's the time for our FIFTY FIRST STEP.